Last week we bid a fond farewell to our regular Gaming App of the Day feature, swapping the aging and uncompromising system for something that gave us the flexibility to be more critical. How'd that work out? See for yourself! 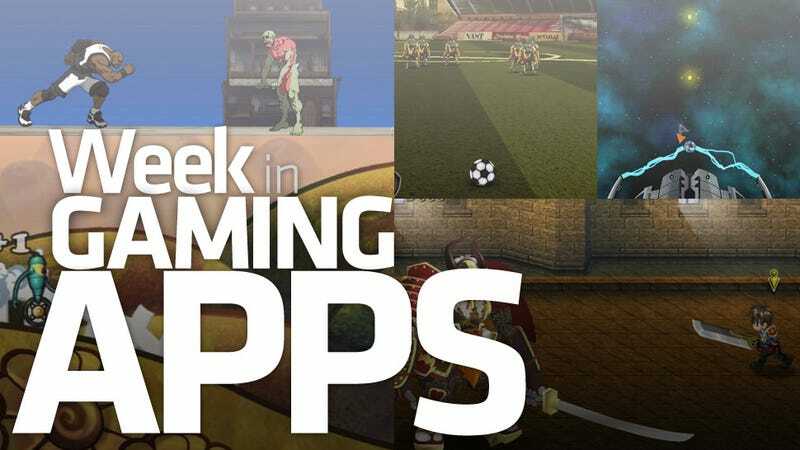 Before you get to the six gaming app reviews we posted this week (five of which were my own), let's take a look at ten games we played this week that didn't get a stab at the spotlight. It was a lovely week for puzzles fans, but then every week is a great week for puzzle fans in mobile gaming. It was also a good week for fans of retro gaming and Shaquille O'Neal, folks that enjoy playing with their music, Japanese role-playing enthusiast and folks that enjoy paying three dollars for a golf game that's not really all that much of a golf game. I suspect that last group is quite small. A platforming puzzle game with a really distinctive style and even more distinctive online multiplayer. Just when you thought there are nothing new to be done with a drop puzzle game, Rise of the Blobs shows up and gets all cylindrical and explodey. Konami's do-it-yourself rhythm game lets players create levels using their own music, and it's free, though purchasing new song slots can get pretty pricey. I love the style of this bizarre little arena battler. I was not expecting a game about kicking soccer balls at zombies to be this entertaining. A really nifty little space-physics puzzle game that plays with propulsion and gravity. It's not much to look at, but it's plenty to excel at. And incredibly complex combination of strategy, simulation and action. Bless the folks at Kemco for bringing so many basic Japanese role-playing games to Android. This is their first game built from the ground-up for mobile. The overlands are still simple, but the battle graphics are quite lovely. I want to hug these people. Worth it if only for the novelty factor. It's Shaquille O'Neal against zombies in a post-apocalyptic wasteland. Why not? I'm including this one as a public service. The graphics on this game are lovely. There's almost no gameplay whatsoever, just hitting balls onto a green against another player. Beware this pretty poison. Waking the Cat is Normally a Bad Idea. This is the Exception.